The anticipated third round on the 2012 IZOD INDYCAR Series tour, the Toyota Grand Prix of Long Beach is one of the oldest and most prestigious open wheel street races in the United States. The 1.968-mile race course has historically been known as a race where passing was a premium. Entering the Toyota Grand Prix of Long Beach, the Chevrolet teams received a major setback what could be one of the least ideal circuit to suffer in qualifying. Engine issues spotted during testing at Infineon Raceway left engine supplier Chevrolet with no other choice but to order their 11 teams to start the IZOD INDYCAR event with new powerplants. With each Chevrolet runner receiving a 10-grid position penalty, the impact of the numerous IZOD INDYCAR teams changing engines made for a confusing ordeal for where qualifying results and the race’s starting line-up was drastically shuffled. Falling behind qualifying winner Ryan Briscoe who was ushered to 11th place in his Chevrolet-powered #2 Penske Racing for the start of the Toyota Grand Prix of Long Beach, the Chevrolet entries were faced with mid-to-rear grid positions ahead of Sunday’s 85-lap event. As the green flag was ready to fall on the Toyota Grand Prix of Long Beach, it would be a big story if Chevrolet teams would be able to charge back to the front. Thanks to the penalties issued to the top Chevrolet-powered Dallara race cars, 4th fastest in qualifying Dario Franchitti would lead the 2012 IZOD INDYCAR with a Honda engine for the first time. 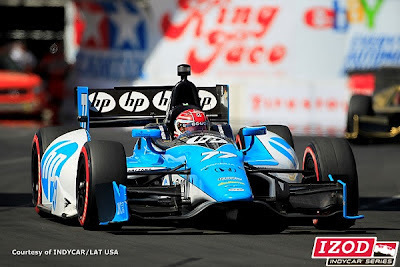 Alongside Franchitti’s #10 Target Chip Ganassi Racing vehicle, Sarah Fisher Hartman Racing’s IZOD INDYCAR Series rookie driver Josef Newgarden saw his 7th place qualifying result parlayed into a front-row start. When the green flag dropped on the Toyota Grand Prix of Long Beach, the race’s first caution flew on the opening lap with an incident between the front-row starters. As the #10 of Dario Franchitti and the #67 of Josef Newgarden raced into the first corner, the battle ended with Newgarden in the tire barriers of turn one. 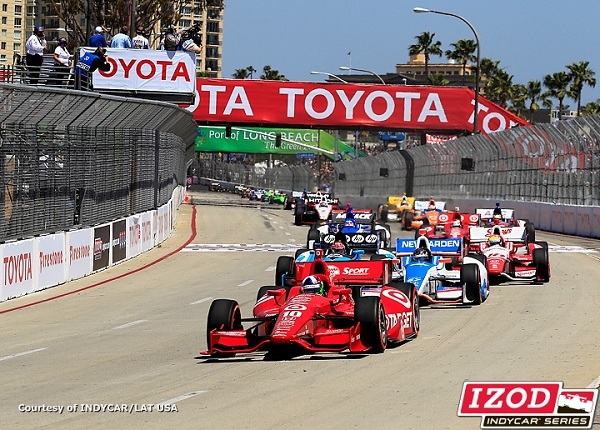 The first retirement of the Toyota Grand Prix of Long Beach, the 2011 Firestone Indy Lights champion Josef Newgarden and the #67 Sarah Fisher Hartman Racing car left the event early. 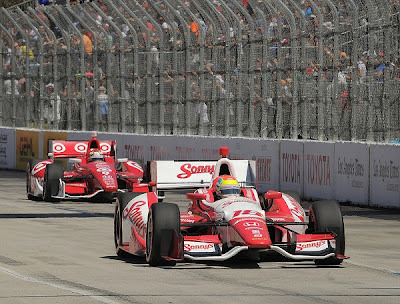 When the field was sent back to green on lap 4, the #10 Target Chip Ganassi Racing car of Dario Franchitti found himself under attack from the Dale Coyne Racing #18 car. Piloted by Justin Wilson, the #18 Dallara-Honda took the lead away from Franchitti on turn 1 for lap 5. At the front, Wilson built up an incredible lead early in the IZOD INDYCAR event gaining a 5 second interval on second-place by lap 12. While Justin Wilson led in what it considered one of the lower-funded race efforts in the 2012 IZOD INDYCAR Series paddock, the #10 car fielded by the wealthier Chip Ganassi suffered a fall down the running order. On lap 10, Simon Pagenaud took second-place in the race from the #10 Target Chip Ganassi Racing entry while Takuma Sato and Franchitti’s teammate Scott Dixon would find their way past the pole-starting machine. The field was slowed again as full-course yellow flew on lap 20 for #7 car of Sebastien Bourdais stopped in turn nine. A quick caution that concluded with the Lotus Dragon Racing entry of Bourdais restarting, some of the leaders decided to use the caution to stop for pit service. With Justin Wilson and Simon Pagenaud pitting, the Rahal Letterman Lanigan Racing team decided to keep their #15 car and driver Takuma Sato out to lead back to green. Taking green for lap 22, the field would be led into the race’s final caution containing a series of incidents spanning from unfortunate to outright bizarre. Immediately on the restart, the #98 Bryan Herta Autosport car piloted by Alex Tagliani received contact from the #5 KV Racing Technology machine of EJ Viso on the Long Beach street course’s frontstretch. “Obviously being in the back like that, as soon as it goes green I just jumped on the inside and passed Viso inside the hairpin, and coming on to the front straight away he just pushed me in to the wall.” said Tagliani after the Toyota Grand Prix of Long Beach as a difficult 2012 season is plaguing the French-Canadian racer. While the #5 car driver described the move by the #98 as “a very dangerous move”, Viso was assessed a drive-through penalty for avoidable contact from INDYCAR Race Control. Viso finished the race 12th while the #98 Lotus-powered entry would only continue past the halfway point to the event. However, less than a minute after the Tagliani/Viso incident, the most dramatic incident of the Toyota Grand of Long Beach (and the 2012 IZOD INDYCAR Series so far) occurred when two drivers from open wheel racing’s most popular families collided. In turn 8, the #26 car of Marco Andretti drove up and made contact with the #38 Chip Ganassi Racing-owned race car driven by Graham Rahal. The nature of the rear end contact sent the #26 Andretti Autosport car into the air crashing back on the race course. The end of the race for both drivers who left the accident unhurt, there were opposing viewpoints on where the fault should have been placed after the crash. Graham Rahal said the #26 car had made an overly ambitious dive into the corner while Marco Andretti said the #38 car was blocking. While the full-course yellow was displayed, safety crew also retrieved two stalled race cars on course. The first one being the #6 vehicle of Katherine legge that stopped on turn 9 following the Andretti/Rahal collision. In the second incident, the #9 Target Chip Ganassi Racing came to a sudden stop on lap 27. For what was said to be a mechanical problem to his Dallara-Honda, Scott Dixon’s two second-place finishes starting off the 2012 IZOD INDYCAR Series season resulted in a retirement for the third event. 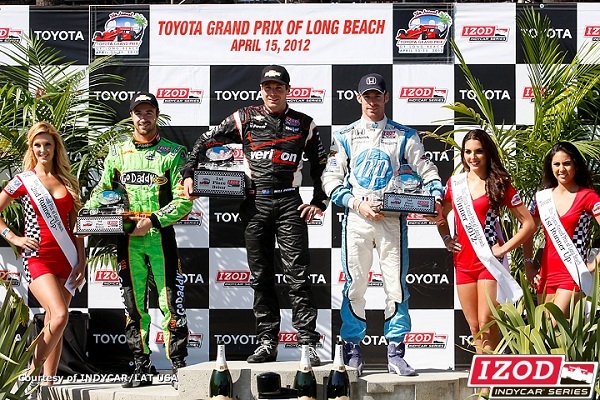 The 2012 Long Beach race was Dixon’s first official did not finish in competition since the 2010 Honda Indy of Toronto. Restarted on lap 30, the Toyota Grand Prix of Long Beach was set up as a pit and fuel strategy event. While Ryan Hunter-Reay and Ryan Briscoe would place Chevrolet-engined vehicles at the top spot of the IZOD INDYCAR street race by the end of the race’s third caution, two Honda Racing Development runners gave some optimism to the single-turbocharged engine’s cause. After leading ahead of the race’s final caution, the #15 car of Takuma Sato spent an extra 8-lap stint in the lead of the Toyota Grand Prix of Long Beach before sailing into the pits on lap 55. Leading for a race-high 26 laps, Simon Pagenaud, driving the #77 Sam Schmidt Racing car, continues to make his 2012 rookie season a strong effort out of the gate. Pagenaud led the IZOD INDYCAR Series race until limited fuel required the driver to pit turning the first-place position over to Penske Racing’s Will Power. Starting the race in 12th spot, Power captured the lead on lap 71 for the first time of the event. As Simon Pagenaud was able to catch the #12 Penske Racing car while Power was told to save fuel, Power held off the aggressive attack of the #77 to win his second IZOD INDYCAR race of 2012 by a tight 0.8675 seconds. "It's a great day for the Verizon Team Penske Chevy. We really didn't think it was possible to win from 12th place here because it was a two-stop race, but once again with (strategist) Tim (Cindric), Dave (Faustino), my engineer, and all the boys we overcame a 10-spot penalty." Said Will Power in post-race interview. Previously winning the Toyota Grand Prix of Long Beach in 2008, the circumstance for that event saw Power winning an INDYCAR event that was also the final race under the Champ Car organization. Tony Kanaan for KV Racing Technology charged from 19th place in his Chevrolet-engined Dallara while JR Hildebrand brought Panther Racing their first top-5 result of 2012. Despite no Chevrolets starting in the top-10 spots of the Toyota Grand Prix of Long Beach, seven of the Dallara DW12 race cars in the top-10 after 85 laps were powered by Chevy engines. The next race for the IZOD INDYCAR Series is a visit to Sao Paulo, Brazil scheduled for April 28th.